Home Front Page Brexit as an opportunity for Africa? 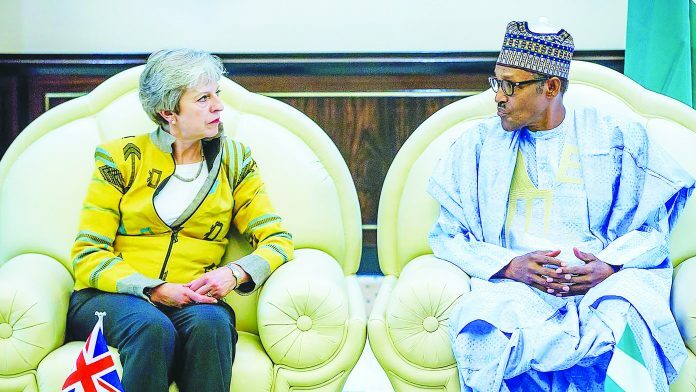 UK Prime Minister Theresa May and Nigerian President Muhammadu Buhari discuss issues during her state visit to Nigeria. Brexit holds new opportunities for African nations. As British Prime Minister Theresa May triggers formal Brexit talks, African nations are gearing up for negotiations of their own. But it’s not all doom and gloom since Brexit could work in Africa’s favor. It will be a big leap into the unknown once the United Kingdom triggers formal talks to leave the European Union. The EU’s existing trade agreements will then no longer apply to Britain and have to be renegotiated. “We don’t know where we are going to end,” Ghana’s Foreign Affairs Minister Shirley Ayorko Botchwey told DW. Traditionally, trade with the UK has been very important for African Commonwealth countries like Ghana. At its peak in 2012, UK-Commonwealth Trade accounted for $120 billion (110 billion euros), according to the Commonwealth. Some are hopeful the UK might be eyeing to boost trade with its former colonies. South Africa has similar hopes to resurrect its relationship with the UK. “Initially there were fears that Brexit would be harmful to the South African economy because of the threat of a decline in European economic growth as a result of Brexit. But those fears have been allayed more recently as we have seen increased interest by the British in South Africa,” said Azar Jammine, Chief Economist at the Johannesburg-based consultancy Econometrix. According to Jammine, it’s all down to how Brexit will affect European economic growth. But since the UK might try to look at new markets once its links to Europe are diminished, African countries could actually stand to benefit. The African Commonwealth nations certainly had more leverage if they negotiated as larger blocs such as the Southern African Development Community (SADC) or the East African Community (EAC), says Brian Wanyama, an economics professor at Kibabii University in Kenya. That’s something Lagos-based financial expert Kasuma Garba Karfi agrees with. “When you are united, you are stronger,” he said, adding negotiations with the UK were going to pose a great challenge. According to Wanyama, the East African countries are rather optimistic about a new trade agreement, pointing to the long-established relationship between the UK and the EAC dating back to the 40s and 50s. However, it’s not yet clear what the UK’s intentions are, says Accra-based financial expert Martey. Isaac Kaledzi, Mansour Bala Bello and Martina Schwikowski contributed to this report. Next articleKavanaugh Confirmed Amid Day Of Protests And More Than 150 Arrests In D.C.